One: Big, hairy insects like spiders and centipedes! I can tolerate small spiders and things like box elder bugs. But when it comes to things that crawl fast and are furry looking, I scream like a little girl! In the first house where Woodworker and I lived, it had an old basement that was moist at times. So centipedes were common, and they would scoot across the floor so fast you’d think it was a mouse! Ewwwwww! Gave me the willies! I like to swim, canoe and sail, but in the back of my mind is always the fear of drowning. Probably I have that fear because when I was young and living at home, there were two little boys who fell through the ice on the river behind our home and drown. That has to be the absolute worst way to go, because for a short bit, you’re aware of what is happening and know the possible outcome. I’d rather go quickly, like being stomped by an elephant or something equally quick. I have been up in a hot air balloon, and I really enjoyed that. I’d even do it again! But the thought of jumping out of something with only a little pillow strapped to your back is something I can’t even comprehend. Why would you DO that?!?!? I hope that everyone who reads this has a very Merry Christmas! I hope Santa was good to you, that you have surrounded yourself with family, friends and love, and that you take the time to remember WHY we have Christmas. Thank you to all my readers, both near and far. You are very dear to me, and greatly appreciated! 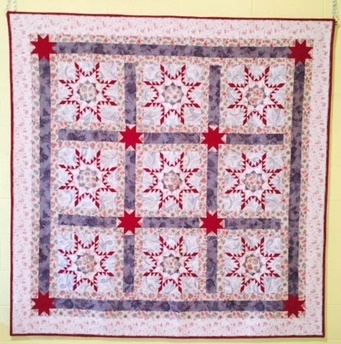 Here’s to more great quilting in 2013! I'm with you on the very large spiders – when we first moved here to Arkansas we used to see tarantulas now and then or something that was very similar to them in size and hairiness. Luckily after we got rid of a little bit of the pine trees close to the house the spiders went away – we still get creepy big ones now and then but not often – I hate them and snakes!